Christmastime in Chile is also the beginning of summer, so the bar team at Red2One in Santiago wanted to create a holiday cocktail that was light and refreshing but still festive. 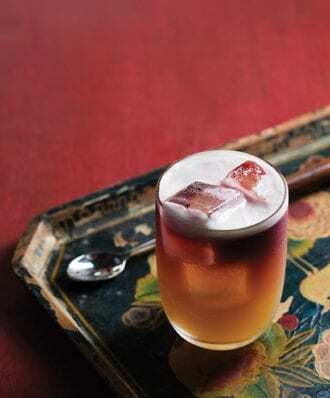 “Alongside Cola de Mono, it’s typical during our holidays to drink refreshing long drinks because it’s Summertime,” says bar manager Juan B. Zambrano V. “We have a lot of fizzes, spritzes and cocktails with wine.” Hence this mix of pisco, Cointreau, citrus, spiced syrup, egg white and red wine. Add all the ingredients, except the wine, to a shaker lled with ice. Shake well, then double-strain into a glass lled with fresh ice. Gently top with the red wine, pouring over the back of a barspoon. Autumn Special Syrup: In a saucepan, combine 3 cups of water and 3 cups of brown sugar, then add 1 orange sliced into 4 pieces with peel, 2 slices of pineapple with peel, 2 sticks of cinnamon, 2 star anise and 3 whole cloves. Bring to a simmer and cook for 10 minutes, stirring occasionally, until the sugar has fully dissolved and the syrup is aromatic. Strain out the solids, and let the syrup cool, then bottle for use. Keep the remainder refrigerated and use within 2 weeks. For today’s holiday giveaway, we’re giving away $150 to spend at Tasting Room redeemable towards a wine tasting kit, free wine profile and 12-bottle wine shipment.